Jerrold E. Levy's masterly analysis of Navajo creation and origin myths shows what other interpretations often overlook: that the Navajo religion is as complete and nuanced an attempt to answer humanity's big questions as the religions brought to North America by Europeans. 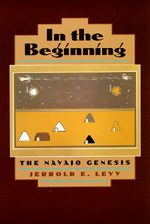 Looking first at the historical context of the Navajo narratives, Levy points out that Navajo society has never during its known history been either homogeneous or unchanging, and he goes on to identify in the myths persisting traditions that represent differing points of view within the society. The major transformations of the Navajo people, from a northern hunting and gathering society to a farming, then herding, then wage-earning society in the American Southwest, were accompanied by changes not only in social organization but also in religion. Levy sees evidence of internal historical conflicts in the varying versions of the creation myth and their reflection in the origin myths associated with healing rituals. Levy also compares Navajo answers to the perennial questions about the creation of the cosmos and why people are the way they are with the answers provided by Judaism and Christianity. And, without suggesting that they are equivalent, Levy discusses certain parallels between Navajo religious ideas and contemporary scientific cosmology. The possibility that in the future Navajo religion will be as much altered by changing conditions as it has been in the past makes this fascinating account all the more timely. Jerrold E. Levy is Professor Emeritus of Anthropology at the University of Arizona. His earlier books include Orayvi Revisited: Social Stratification in an "Egalitarian" Society (1992), and Drinking Careers: A 25-Year Study of Three Navajo Populations (with Stephen J. Kunitz, 1994).